xpected to be bigger and better than before thanks to a change in format, the Bangalore Open Air is powering on despite being the platform for a niche musical genre like metal. a�?What wea��re doing this year is having lead up gigs and on the final day, international bands such as Napalm Death, Belphegor, Inquisition, Gutslit and Orator,a�? shares Salman Syed, founder of Infinite Dreams Artist Management and the man behind BOA. Powered by the iconic Wacken Festival (an open-air heavy metal music festival in Germany), Syed hopes that someday soon, this too will be on par with what he calls the Mecca of Metal. a�?The fans here are on par with those abroad, but what is more encouraging is that the artistes are as good too,a�? says the metal fan. And we catch up with one such band, Kryptos, before they take centre tage and keep the national flag flying for metal. Influenced by the likes of Judas Priest, Iron Maiden, Thin Lizzy and Paradise Lost, Kryptos has sealed itself as one of Indiaa��s foremost metal bands. 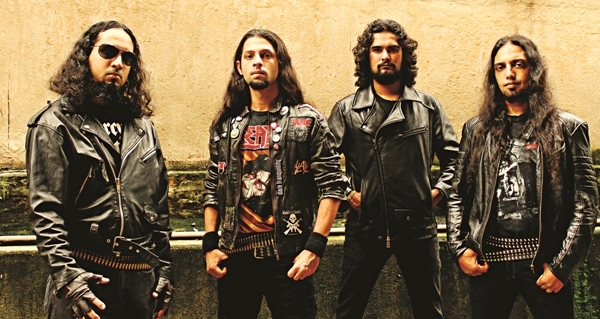 Currently comprising Nolan Lewis, Rohit Chaturvedi, Ganesh Krishnaswamy and Anthony Hoover, the band, which started out in 1998, will bring their trademark leather, denims and head banging to Vapour this evening. Lead singer and guitarist, Lewis gives us a back stage pass. Thoughts on Indian music festivals. Having toured Europe extensively, we find that it really helps to build a following. You dona��t even need promotion for the next year as the music goes out to thousands of people in one go. To keep a musiciana��s spirit up, you need constant performances and that you can achieve by going on tour. Here, unfortunately, you cana��t just take off work for a few months, so we need to have more festivals more frequently. Napalm Death. Theya��re a British-American extreme metal band that has been around from the 80s. And the vibes at this festival are on par with European ones so wea��re looking forward to that too. Give us a sneak-peek into the set list. We are heading to Europe in July so will be playing the same set list. It will almost be like a warm-up for us to get back in shape. Wea��re going to also do a few old songs, which havena��t been heard in a while. On the top of that revival list is Descension, one of the first songs we ever wrote. When we are at loggerheads about music, we usually head out, get a few drinks and the next morning we dona��t remember we had creative differences! But wea��ve been friends so long now that we know each othersa�� quirks. Wea��ve reached a comfortable place creatively. Pick a band to cover your songs. I would like to hear Bevar Sea cover our kind of music. It is a local band who are our good friends. But they down-tune everything. Ita��ll be interesting. And Ia��d also love to do our version of any one of Frank Sinatraa��s songs. I love his music, but I am sure hea��ll be turning cartwheels in his grave if he heard a metal version! The Bang Your Head and Keep It True festivals in Germany.